Today: How an understanding of brain lateralization can help us design better software. First let's clear the air. 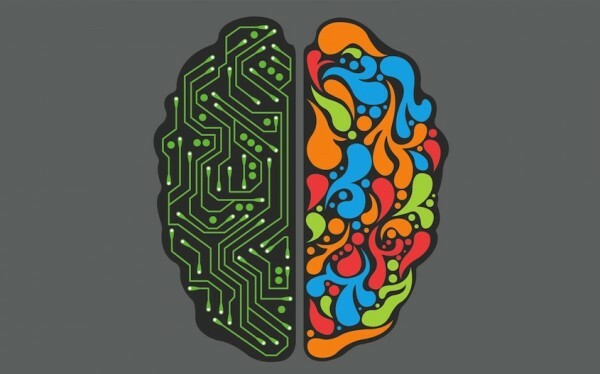 There's been a lot of cringe-worthy popular science written about the divided brain. The most nauseating are the articles that ask: Are you a left-brained 'logical' person or a right-brained 'creative' person? But the distinction between the hemispheres is very real, and there's a lot of solid neuroscience waiting for us if we can push past the nausea. Considered carefully, it can shed light on how users process information and interact with technology, and ultimately it can help us make better-informed design decisions. Maybe not the most nuanced view. Conway's Law should be familiar to everyone who works on a software team. It states that "organizations which design systems ... are constrained to produce designs which are copies of the communication structures of these organizations." If you have four groups working on a compiler, you'll get a 4-pass compiler. Conway's Law is a simple function of network topology. Imagine two engineering teams, one working in San Francisco and the other in New York. For all practical purposes, the cross-country bandwidth (low) and latency (high) requires that the two teams specialize in different products, or at least different parts of the same product. It's just too inefficient otherwise. And so it is with the brain. The left and right hemispheres are almost entirely separated, with only a narrow channel (the corpus callosum) through which to exchange information. In terms of bandwidth, intra-hemisphere communication completely dominates inter-hemisphere communication. From a systems design perspective, this architecture suggests (requires?) that the two hemispheres should specialize in processing different kinds of information. And this is exactly what we find. Not only in humans but across the animal kingdom, the left hemisphere specializes in narrow-focus, manipulative attention, while the right hemisphere specializes in broad, holistic awareness of the environment. There are other important differences, especially for humans, and we'll get to them in a minute. But this is the highest order bit. Narrow vs. wide. Spotlight vs. floodlight. Manipulation vs. awareness. Right on the left, left on the right. Most of the literature on brain lateralization is concerned with locating cognitive functions in one hemisphere or the other. Thomas Nagel once famously asked, "What does it feel like to be a bat?" Similarly, when thinking about the divided brain, we should ask, "What does it feel like to be the left (or right) hemisphere?" How does each hemisphere experience the world? What types of attention does each hemisphere pay, and to which kinds of information? In other words, we need to use empathy as well as analysis. This, too, is obvious once you think about it. Half a brain is more like a brain than like a refrigerator. Patients with severe damage to one or the other hemisphere are still people. They may behave strangely, and they may have different ways of experiencing the world. But they are still conscious — the kinds of things we can imagine what it feels like to be. So instead of talking about the 'left hemisphere' and the 'right hemisphere,' let's talk about Larry and Roger — conjoined twins with two very different personalities. 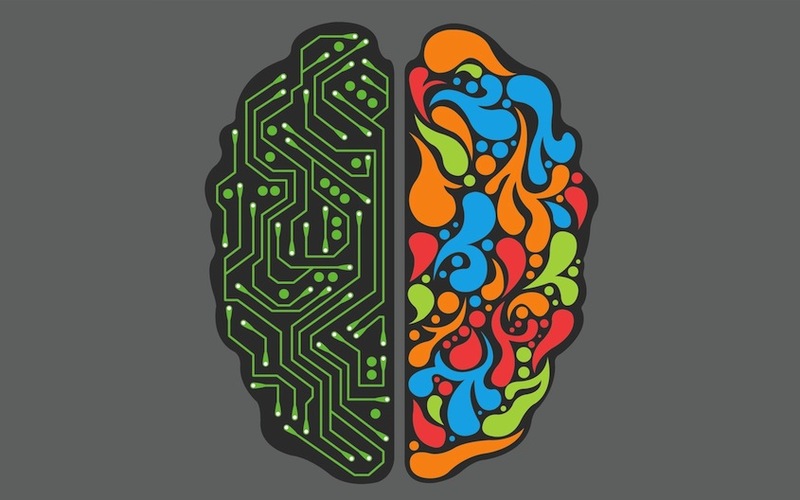 We're going to treat them as user personas (psychographic profiles) for the two sides of the brain. Larry lives in a world of representations. Rather than confronting reality directly (in all its gory detail), Larry's brain re-presents it to him in abstract, sanitized, symbolic terms. Larry is an expert in narrow-focus attention. He sees a world of separate objects, which is what enables him to use words and tools. He relishes precision. He likes to break things down, analytically, and attend to each piece in isolation. He likes facts, numbers, names, and dates, because they're discrete units his mind can latch onto. Larry likes language. He understands words and their meanings (especially their denotations), as well as syntax and grammar. He also likes habit and routine. Attending to new information is Roger's domain; Larry prefers to work with known information. Larry, I think it's fair to say, has a pretty extreme form of Asperger's. Roger lives fully in the present moment, the world of the here and now. He confronts external reality as directly as possible, because his hemisphere is responsible for manifesting it in all its messy, intricate, squishy detail. Roger likes people. He's a social creature. He understands relationships, particularly in terms of nonverbal elements: emotions, body language, facial expressions, gestures, inflection, tone of voice, etc. Roger thinks holistically, in terms of the gestalt. When taking in a scene, he doesn't break it down into its component parts, but instead attempts to understand it as a whole. He's especially concerned with new information, because he alone has the scope to absorb it. When something pops up in front of him, Roger is the first to react to it — to put it in context and assign relevance to it. In trying to make sense of the world, Roger relies on stories and metaphors rather than symbols. If Asperger's is the best motif for understanding Larry, then improv is the motif for Roger. Whatever skills are needed to improvise on-stage, they're found in the right hemisphere. This is all well and good, you say, but what does it tell us about how to build software? Well, Larry and Roger aren't just different types of people. They're different types of users. They have different priorities, motivations, and goals — and as we've seen, they pay attention to different types of information. In short, they have different ways of relating to software. Larry thinks of a computer as a tool. When he sits down, he has a specific purpose in mind, and he wants the computer to help him accomplish that task as efficiently as possible. Larry needs to be in control. He wants to tell the computer what to do, and when, and how, and he's easily frustrated when software behaves in ways he can't control. In order to make the computer more predictable, he likes to develop a mental model for how everything works. The more intelligible it is, the more Larry will engage with it. In terms of interface elements, Larry likes discrete units of text — labels, numbers, dates. He likes inbox-style controls for managing read/unread status, rather than confronting open-ended feeds. Insofar as Larry needs to communicate, he prefers asynchronous, textual media like email. Roger loves his computer. He doesn't really understand how it works, but that's okay, because most software at least tries to meet him 'halfway' by presenting information in metaphors. He doesn't need to have a rich mental model of what the computer is doing (or a lot of options for configuring it), as long as it mostly "just works." He may not be able to articulate what he wants, but he knows it when he sees it. He likes technologies that present him with a lot of information. He's great at sifting through it quickly to determine what's relevant. He mostly uses the computer to have experiences — to connect with people, to find new things, to have fun. He craves novelty and is comfortable with surprise and spontaneity. As such, he likes push notifications and random browsing. In terms of communication, he prefers realtime media — and the more subtext, the better (e.g. video chatting). When he's forced to use text to express himself, at least he has emoticons. It should go without saying, but I'll say it anyway: Larry and Roger aren't real people. This is very important. There are no pure-Larry or pure-Roger users. All flesh-and-blood users are full-brained people, bringing both of their hemispheres to bear on every problem or use case they encounter. But this doesn't mean Larry and Roger are meaningless. Personas (by their very nature) are fictions — abstractions that help us reason about user motivations, goals, skills, attitudes, etc. They're like principal components in the space of all possible users. Actual, specific users are always linear combinations of the various personas. Some designs can serve both personas, but there's a lot of tension between them. Larry and Roger care about and pay attention to different things, and a choice that serves one of them might alienate the other. So when tradeoffs must (inevitably) be made, it's critical to understand who you're designing for. Again, no use case is 100% in Larry's domain or 100% in Roger's domain, but use cases typically skew in one direction or the other. To figure out whether you should prioritize Larry's needs over Roger's needs or vice versa, the first question to ask is how users are going to approach your software. Do they see it as a tool, or as an experience? If it's the former, Larry is your primary audience (with Roger playing a supporting role). If it's the latter, then you should target Roger (while doing as much as you can to keep Larry happy). Now let's look at some technologies to see how they serve Larry and/or Roger. Command-line interfaces are, without question, Larry's tools. He loves the precision and control that a command line affords him. When presented with a command line, Roger starts to tune out. Posing as a helpful friend — i.e., imposing a social metaphor rather than playing into the tool metaphor. These are grave sins against Larry's state of flow — and the universal hatred of Clippy confirms that Word must ultimately cater to Larry. Google search is similar to a command line in many ways. It puts the user (mostly Larry) in control, and gives precise, text-based answers to verbalized queries. But Roger is important too. He scans the results to figure out which is the most relevant. Roger is the one who makes sense out of the little blurbs that Google lays out underneath each search result. Facebook. Finally, here's a piece of software that Roger can wholeheartedly embrace. It's social, it's heavy on pictures, and there are emotional resonances everywhere (e.g. the "like" button). Roger gravitates to new information and he thinks in terms of stories, so the "news feed" is right up his alley. If he's feeling frisky, he can 'poke' his friends — a digital metaphor for friendly body language. Larry isn't totally left out (there's a lot of text and facts for him to latch onto), but Roger is definitely in the driver's seat when browsing Facebook. Wikipedia is a repository of information produced by the Larrys of the world and optimized for their consumption. It's primarily text, it's static, it's written from the neutral point-of-view, and there's not a social element in sight. Everything is designed to make Larry feel right at home. The few elements that engage Roger — the "random page" option, serendipitous linking — do so without distracting Larry. The only exception to this, as far as I can tell, are the donation banners that appear during fundraising drives. These banners obtrude upon the page, show human faces, and make emotional appeals. Of course, it's no coincidence that these banners target Roger, because he's the one more likely to respond to them. Quora has something to offer both hemispheres, but ultimately it sides with Roger. Unlike Wikipedia, which holds to the ethos of neutrality, Quora encourages users to share opinions, stories, and other subjective experiences. It's also situated in a social context that accentuates new information (the feed, notifications, realtime updates, etc.). In other words, it's designed to be an experience more than a tool. You can hear Larry's laments all over the Rage Against Quora blog. These users want more predictability and fine-grained control — over their notifications, their feeds, moderation policies, question changes, anonymity, saving content to read later, etc., etc. It's no coincidence that the people who post on Rage Against Quora are power users who contribute heavily, because they're the ones who would benefit the most if Quora were designed to be more of a tool. Email is social, which is Roger's domain, but as social technologies go, it's heavily optimized for Larry. It's text-heavy, asynchronous, and offers lots of control over labels, read/unread status, etc. Email is an extremely reliable and predictable tool; whatever action he decides to take, Larry can confidently predict the outcome. Roger isn't alienated by email, but when he really needs to connect with someone, he'll choose to video chat. It's realtime with plenty of nonverbal subtext. The social features weren't overly prominent. Larry could use Reader without sharing or "being shared at." It had read/unread management for shared items. The sharing model was simple and intelligible. If you shared something, it showed up on your friends' Readers, and vice versa. Nothing got pruned away by an inscrutable algorithm. RIP Google Reader. You will be missed. Finally, I'd like to hazard the opinion that Snapchat is, even more than Facebook, the ultimate app for Roger. It's purely social. It's spontaneous. It's images rather than text. And, because impermanence is part of its core DNA, it does a better job than any other piece of technology of allowing users to live in the present moment. The past and the future are for the left hemisphere, while here-and-now is the domain of the right. Mobile devices are unique in a lot of ways. They're hardware as well as software. They're wearable, so they become more tightly integrated into our lives. And they're platforms, so they support an extensive variety of use cases. It would be interesting to look at the various features of these technologies and ask how they serve the left and right hemispheres. But there's something deeper and more important at work here, and I don't want to risk putting the cart before the horse. Wearable computers change the very relationship between the hemispheres. To understand this — and what it means for civilization (yes, the effects are that big) — we'll have to back up and look at other technologies that have reshaped consciousness and cognition in comparable ways. But — sorry to be a tease — these will have to wait for another time. Thanks to Diana Huang for reading a draft of this essay, and to Alex Vartan for the seed of these ideas (and for introducing me to Iain McGilchrist). Originally published July 2, 2013.